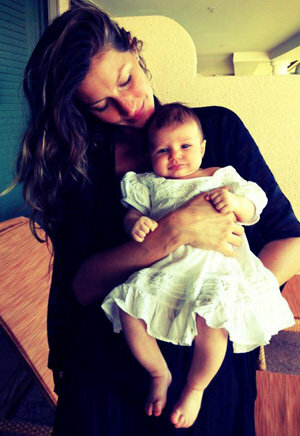 The Brazilian supermodel gave birth to little Vivian Lake in December and took to Facebook to post a picture of her cradling the adorable tot. Alongside the photograph, she wrote: "Love is everything!!! Happy friday, much love to all. (sic)"
Gisele already has three year-old son Benjamin with husband Tom Brady and after Vivian's birth she spoke of her joy about having another baby. She said: "We feel so lucky to have been able to experience the miracle of birth once again and are forever grateful for the opportunity to be the parents of another little angel. "Vivian Lake was born at home on December 5. She is healthy and full of life." The 32-year-old catwalk beauty went on to thank her fans on behalf of her and her family for all their congratulatory messages. She added: "Thank you all for your support and well wishes. We wish you and your families many blessings." Tom - who plays football for the New England Patriots, who are based in the Greater Boston area - also has a five-year-old son, John, with ex-girlfriend Bridget Moynahan.